With the losses and the bounces in weight... 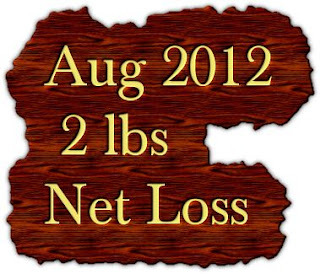 I came out with a 2 pound net loss for August 2012. This makes 4 months of consecutive weight loss. In the past I would rapidly lose 10 or 20 lbs... then regain 30 or even 40.
ust walking, working, and riding the stationary bike. I need to add in some Hip Hop Abs and/or Turbo Jam... keeping it low impact is a must... and I can adjust both of those to low impact... well keeping it low impact is a must if I intend to continue being able to walk... so yes I would say it is a must. Even the tread mill is questionable with my right knee. I took the speed up too high and the knee went. So I'll just keep it slower and gradually rebuild the muscles around the knee. Twisting steps are a problem as well. Tends to pull the knees out of alignment... If I'm careful I think I can do the Hip Hop Abs... I am sure Turbo jam would work for me. I will stick with the lightest level and pace myself. Seriously do not need to re-injurer myself. Well here is cheers to 2 pounds net loss... I would have rather it have been 20... but hey I'll take the 2 pounds... yeah! Shakeology... does a body good... full of vitamins and minerals and quashes cravings... yeah!